Two weeks late, my son was delivered by emergency c-section on December 2, 2004 because his heart rate was dropping. My husband watched the whole thing and when Harrison came out, he did cry but looked very blue. He asked if that was normal and they said they would like for the baby to pink up so they were smacking his feet. They brought him to me for a kiss and then rushed him to the NICU. They explained to my husband that he may have a heart defect. Harrison was born at 1:01 AM and by 8:00 the pediatric cardiologist was in my room with a diagram of Harrison’s heart defect, Tetralogy of Fallot. From that moment on, everything moved very slowly, once piece of information at a time. Then the second day of his life it was decided that he needed to be transferred to the Children’s Hospital of New York for surgery. I could not handle seeing my baby in the NICU – so big and yet so sick. He was easily the biggest baby in there, 9 1/2 lbs. but he was on a respirator and sedated. Harrison struggled with some lung issues so his surgery was postponed for a week. 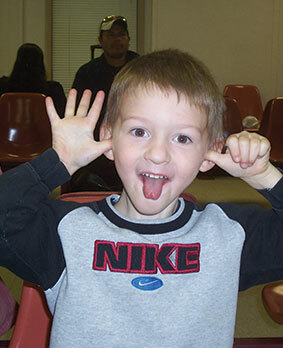 He was scheduled for a full repair on December 13, 2006 at 11 days old. He started to recover quickly and impressed everyone. Within another week, he was sent back to our local hospital for recovering a little more and mostly to get the hang of drinking from the bottle. The roller coaster was set in motion again. Everyone at the other hospital wanted to do things their own way. They ignored previous doctor’s notes and while feeling him the first time via the NG tube, he spit it all up right away. Turns out he needed to be fed a little slower. Days went by and we started to think he would make it home by Christmas. One day holding him all of a sudden I saw a hole at the top of his surgery scar. They assured me it didn’t look bad or infected but would call his surgery team at the other hospital. Within a day, the tests came back bad and without even telling us they transferred him back to Columbia Presbyterian Hospital. We were devastated he had a staph infection. This recovery was worse than the heart surgery and actually scarier since no one could say for sure what would come of it. They had to open him back up, clean out the wound and stitch him back with not-as-pretty stitches since the skins was no longer healthy. After struggling with many different nurses, trying to get them to give him a little more time at feedings, he finally came home to us on January 19, 2005 with a Broviac line. Not what a new mom and day expect by any means. Since then we have still been reeling from medical bills, the constant wonder of what if and what will come. I always wonder what it would be like to give birth to a healthy baby, have them handed to me, sleep in my room with me, hear their crying and comfort them from the fist moment of their life. I was robbed of that by this condition and I pray some day that there will be a cure from Congenital Heart Defects and no other parent will have to deal with it.